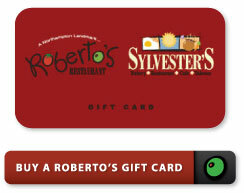 Roberto’s, Northampton’s landmark Italian restaurant, and Sylvester’s, the city’s favorite meeting and eating place for breakfast, lunch and weekend brunch, have gift cards available in any denomination, perfect for the holidays and any other gift-giving occasion. Sometimes the most thoughtful gift takes the least amount of shopping. That’s especially true when you select gift cards for great dining at Roberto’s or Sylvester’s. Order your gift cards securely via credit card or PayPal. Copyright © 2019 Roberto's Restaurant. All Rights Reserved.